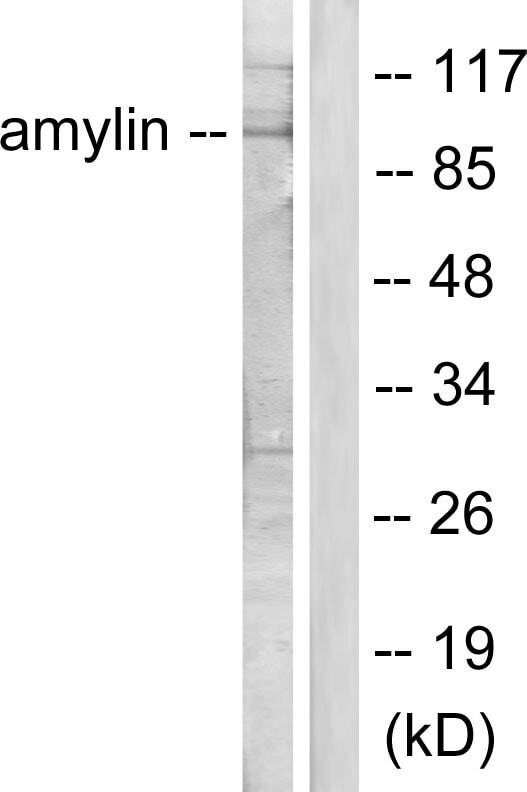 ab55411 detects endogenous levels of total Amylin/DAP protein. Synthetic peptide corresponding to Human Amylin/DAP. Our Abpromise guarantee covers the use of ab55411 in the following tested applications. Belongs to the calcitonin family. The mature protein is largely unstructured in the absence of a cognate ligand, and has a strong tendency to form fibrillar aggregates. Homodimerization may be the first step of amyloid formation. Amyloid fibrils are degraded by IDE. Western blot analysis of lysates from HeLa cells, treated with EGF 200ng/ml 30', using Amylin Antibody. The lane on the right is blocked with the synthesized peptide. 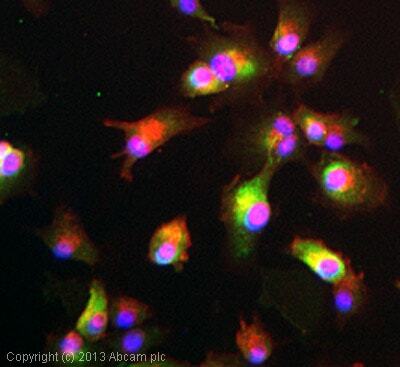 ICC/IF image of ab55411 stained U87-MG cells. The cells were 4% formaldehyde fixed (10 min) and then incubated in 1%BSA / 10% normal goat serum / 0.3M glycine in 0.1% PBS-Tween for 1h to permeabilise the cells and block non-specific protein-protein interactions. The cells were then incubated with the antibody ab55411 at 5µg/ml overnight at +4°C. The secondary antibody (green) was DyLight® 488 goat anti- rabbit (ab96899) IgG (H+L) used at a 1/250 dilution for 1h. Alexa Fluor® 594 WGA was used to label plasma membranes (red) at a 1/200 dilution for 1h. DAPI was used to stain the cell nuclei (blue) at a concentration of 1.43µM. Immunohistochemical analysis of paraffin-embedded human brain tissue using ab55411 (1/50 dilution), in the presence or absence of the immunizing peptide. ab55411 has not yet been referenced specifically in any publications. Publishing research using ab55411? Please let us know so that we can cite the reference in this datasheet. I am trying to detect Human amylin/ Human Amylin Oligomer expressed in tissues of Human amylin transgenic mice via Western blot and immunohistochemistry. I have found 4 antibodies from your website that may be suitable for the work. I am just wondering if you could recommend one or two that maybe best suited for work I planned to do? The antibody should be specifically for human and does not cross react with mouse or rat. Thanks. Concerning ab18018 - there is significant sequence homology between human amylin and that of mouse and rat, but this antibody has only been tested with human samples. Unfortunately, we do not have any experimental data regarding the cross-reactivity of ab15125 and ab15128 and ab55411 with mouse or rat samples too. I compared the immunogen for ab15125 with that of the mouse and rat Amylin proteins and the percentage homology for both is 100%. Based on that information ab15125 is most likely not suitable for your application.